One of the best things about Easter is gathering the family together and enjoying a home cooked roast dinner. This is a time to celebrate as a family and splash out of some quality ingredients to create an Instagram worthy dish. With that in mind, we’re sharing some of our favourite Hereford beef Easter recipes. We hope you’ll try one to cook and eat with your loved ones this Easter. This is a roast dinner to beat all roast dinners. Ask your butcher for 2kg of Hereford sirloin and don’t forget the 2kg of beef bones with bone marrow to make the most delicious gravy you ever did have. The recipe isn’t too difficult to follow and there are plenty of little jobs that you can share out with the rest of the family. Give yourself just under six and a half hours to prepare and cook this dish, which will serve 6 people and leave enough for some leftovers on Monday. Here’s a list of ingredients and the cooking method for the beef, Yorkshire puddings, gravy, and horseradish sauce. If you have regular roast dinners, you might fancy something different. 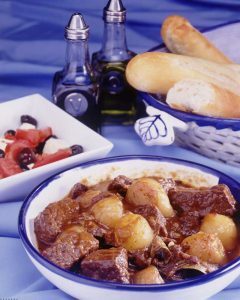 Stifado is a Greek dish, made with Hereford beef and plenty of red wine. Ask your butcher for 675g of cubed Hereford stewing beef and treat yourself to a bottle of Greek red wine, don’t forget a second bottle to enjoy later too. This is a hearty dish that works beautifully with potatoes or even pasta if you really want a different Easter dinner. Click here for the recipe and method. If the cold spell returns you may fancy a dish that will warm your very soul. Hereford Oxtail and dumplings will certainly fill you up and leave you with a warm glow for the rest of the afternoon. Ask your butcher for 1,3kg of Hereford oxtail pieces and don’t forget the mustard and brown ale (stout will work too!). Serve this dish with potatoes and savoy cabbage, it’s delicious. Click the link for a list of ingredients and method. What are you going to eat on Easter day? Share your Hereford beef dishes with us over on our Facebook page or tag @Herefordbeefuk on Twitter.